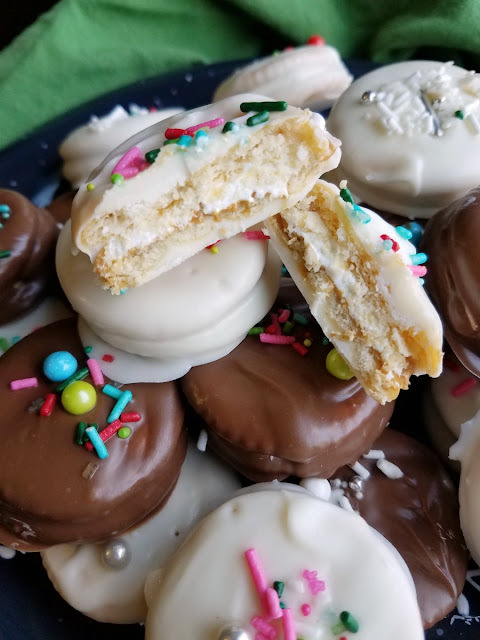 The perfect combination of textures and flavors, these chocolate dipped fluffernutter cookies are a great no bake treat. Peanut butter and marshmallow come together for the ultimate sweet and salty, crunchy and creamy cookies. 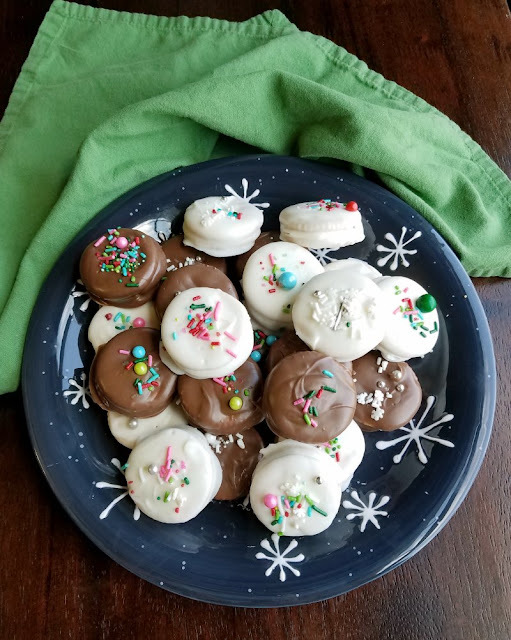 This post is sponsored in conjunction with Christmas Cookies Week . I received product samples from sponsor companies to aid in the creation of the Christmas Cookies Week recipes. All opinions are mine alone. Chocolate dipped fluffernutter cookies are the ultimate combination of sweet and salty, crunchy and creamy. 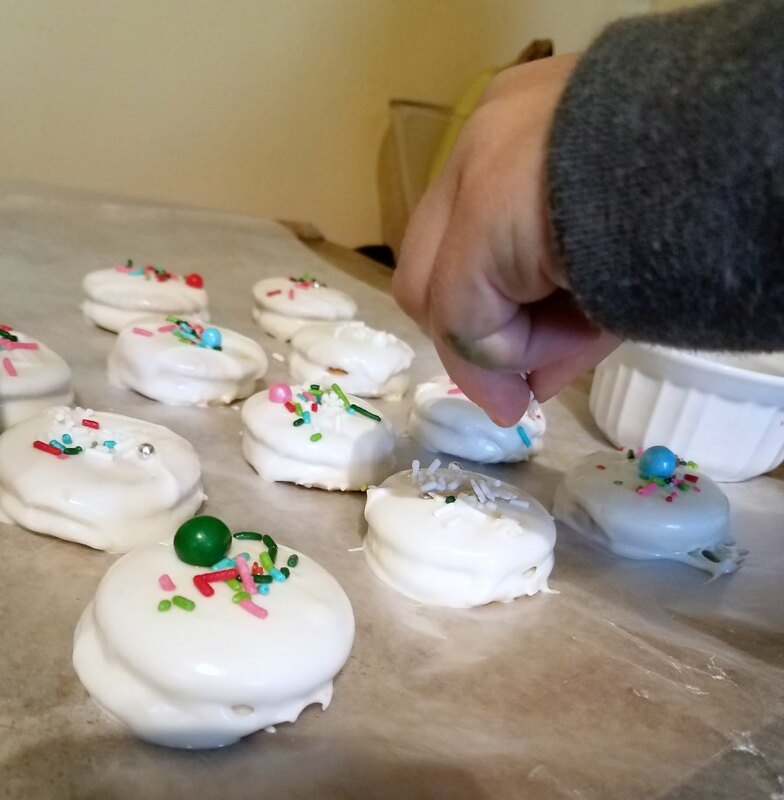 They take one of our family's favorite Christmas cookies to the next level with a little bit of marshmallow fluff. It is Christmas time afterall! My family is relatively adventurous when it comes to food. They are around me quite a bit so they are used trying all sorts of food experiments. They are almost always ready to try new things and they are happy to give their opinions. Even on the holidays, we like to throw in a new thing here and there. Maybe a different side dish on Thanksgiving and a new cookie or two on Christmas. But there are a few must haves that have to be on the table to make the holiday official. With our bunch, chocolate dipped peanut butter cracker cookies are one of those things. Are they a thing in your family as well? They are nice all the way around. First there is the ease of making them and the lack of baking, so they don't take up valuable oven space if you are going crazy on Christmas cookies. Don't mind the marker on his fingers. He's an artist and can't help it! Plus there is just something about the combination of creamy peanut butter, salty butter crackers and the sweet crisp of the chocolate coating. It just all blends together so nicely and they are always a hit and I can imagine the grumbling there would be if somehow we managed to make it to Christmas without any. Seeing as those cookies aren't on my blog yet, I thought it would be fun to share them. But in typical Carlee fashion, I couldn't just leave them alone. So I took them to the next level and added a layer of marshmallow fluff to the center. Now we have ourselves a fluffernutter cookie! That's right, I basically took the childhood favorite of a fluffernutter cookie and mashed it up with another childhood favorite, the peanut butter sandwich cookie. The results were pretty darn good if I do say so myself. Of course they would taste delicious no matter what, but a simple cookie like this is always better with super festive sprinkles. You do eat with your eyes first afterall! So I was really excited to use my new sprinkles from Sprinkle Pop! The fahoo fores sprinkle mix and winter wonderland sprinkle mix were both darling on the cookies. As these things go, I didn't get to apply any myself. Little Dude is the official sprinkle master of the house. He artfully decorated each cookie and had a blast doing it. 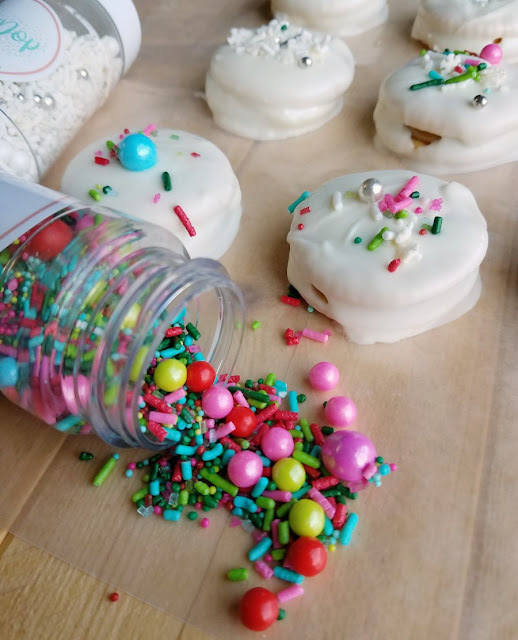 These sprinkle mixes are so much fun to use. There is so much variety in the mix that your cookies are bound to turn out cute as can be no matter what you do! I served these up at a bags tournament we hosted a few weeks back. Side note: We call the game bags, maybe some of you call in corn-hole or some other name? It's the game where you throw beanbags at a board. You earn a point if you land it on the board and 3 if it falls in the hole. Do you play that one too? Anyway, we had a long afternoon of competition ahead of us, so we needed snacks. In addition to the savory stuff I did what you do when you are a food blogger, served Christmas cookies in October. Hey, nobody complained! I was a little worried the little layer of marshmallow creme wouldn't be enough to stand out, but I was wrong! My sister-in-law noticed immediately and was over the moon excited about them. My grandma wasn't quite as impressed. She said hers didn't have enough peanut butter for her liking. I guess you can't win them all! I will make her another batch before Christmas with a heartier peanut butter layer and see what she thinks. I am a peanut butter lover, so I am always ok with adding more peanut butter to the mix! This is the end of my #ChristmasCookiesWeek journey for the year. I have so many fun things planned for you the next few weeks, I just couldn't squeeze in another recipe. You can find plenty of more inspiration below though and I have plenty of great cookies in my archives if you are looking for more ideas! Make sure to enter this fun giveaway while you're here and check out all of the fun cookie recipes below. For more information on the prizes you can win, check out my welcome post HERE! Spread a thin layer of peanut butter over half of the crackers. Spread a thin layer of marshmallow fluff over the other half of the crackers. 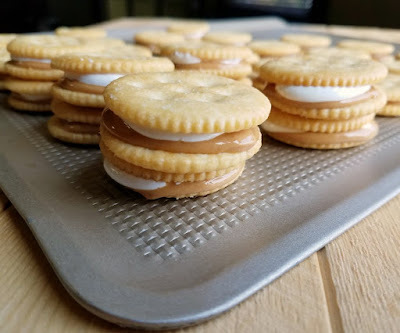 Put each marshmallow fluff cracker together with a peanut butter to form a sandwich. If you have time, freeze them for a couple of hours. Melt chocolate or almond bark in a double boiler or using short bursts in the microwave. Dip cracker sandwiches in chocolate and place on wax paper. Add sprinkles and allow to sit until hardened. Store at room temperature until ready to serve. *If using chocolate chips instead of almond bark, add about a Tablespoon of shortening in with 16 ounces of chocolate chips. Disclaimer: Thank you #ChristmasCookiesWeek sponsors: Adams Extract, Sprinkle Pop, YumGoggle and Silpat for providing the prizes free of charge. The #ChristmasCookiesWeek giveaway is open to U.S. residents, age 18 & up. All entries for the winner will be checked and verified. By entering you give the right to use your name and likeness. The number of entries received determines the odds of winning. Four (4) winners will be selected at random from entries received. The prize packages will be fulfilled by and sent directly from the giveaway sponsors. #ChristmasCookiesWeek bloggers are not responsible for the fulfillment or delivery of the prize packages. Bloggers hosting this giveaway and their immediate family members in their household are not eligible enter or win the giveaway. No purchase necessary. Void where prohibited by law. This promotion is in no way sponsored, endorsed or administered by, or associated with Facebook, Instagram, Pinterest, Twitter or any other social channel mentioned in the #ChristmasCookiesWeek posts or entry. I absolutely love the addition f the marshmallow cream. Fluffer HEAVEN in a cookie!! 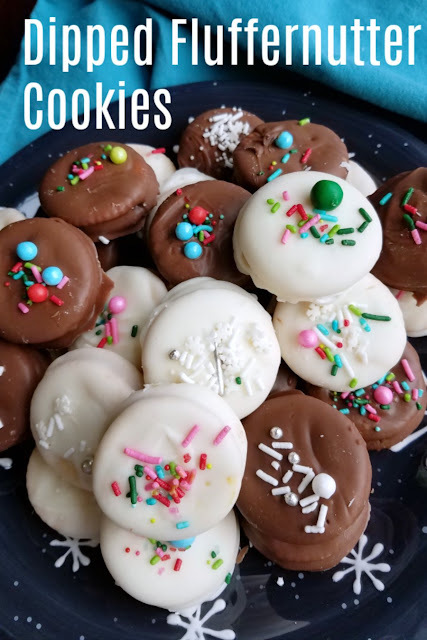 It really makes these cookies even more fun! I love this as a no bake option. Peanut butter and marshmallow rock! The oven is plenty full of other cookies, so it is nice to have some no bake recipes too! Hi Carlee, Oh how I wish we got marshmallow fluff here! Little Dude did a fine job decorating them too. I need to get you an hour or two in one of our grocery stores ;-) I will let him know you approve of his work! If only I had marshmallow fluff in the house right now! You'll have to get it on the grocery list!